The album was released in late May last year. I'm often late in picking up the interesting stuff from Cuneiform, some way or another... But never too late to discover a true classic with close to infinite longevity. Guapo started as an experimental noise duo in the mid-1990s and turned into an experimental rock combo in the early 00s around the time multi-instrumentalist Daniel O'Sullivan joined the band (he left around 2008 and has in parallel and later been involved in Æthenor, Ulver and the live version of Sunn O))) among others). The line-up of Obscure Knowledge as with the successor, the mighty History Of The Visitation from 2013, includes founding member David J. Smith (drums and percussion) along with Kavus Torabi (guitars, also of Knifeworld, Cardiacs, Monsoon Bassoon and Gong to name a few), James Sedwards (bass, also of Thurston Moore Band, Nøught, Zodiak Youth and Chrome Hoof) and Emmett Elvin (keyboards, also of Chrome Hoof and Knifeworld and the live version of Sunn O)))). The latter left Guapo after the release of Obscure Knowledge. Wow! We may conclude that Guapo has ambitions to fathom it All on the new album... When we add that the band play their own kind of avant- or prog-rock, we may have scared the last potential listeners away. But fear not, this is not avant or prog as in pompous self-indulgent excesses. 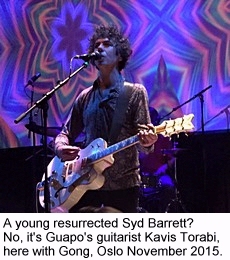 The members of Guapo are too clever for that. Obscure Knowledge is divided into three tracks cunningly titled "Obscure Knowledge I", "Obscure Knowledge II" and "Obscure Knowledge III". The first part lasts more than 25 minutes of the 43 minutes in all. Here are elements of old fashioned melodic progressive rock of the King Crimson school, Rock In Opposition (RIO) kind of avant-rock (Guapo played along with Magma, Univers Zero, Present and other likeminded bands at the RIO festivals in 2007 and 2013), post rock, repetitive hypnotic stuff, noise, jazz, fusion, minimalism, drone stuff, something approaching metal, even funky elements, etc. etc. A few examples: Close to the organ and guitar dominated start and towards the end of the first part they are on the verge of becoming pompous in the old fashioned progressive symphonic-rock way, but only nearly. The short (only four and a half minutes) part II is a welcomed drone'ish floating interlude with ethnic over- and undertones, not least due to the woodwinds provided by guest Michael J. York (of Coil) who's also present on part "III". Part "II" reminds of the instrumental excursions across Tibet on Famlende Forsøk's most recent effort, Washing China. And that's always a treat if you ask me. Part III continues what the band got started in part "I", with more jazz-noise and funky elements (not at the same time!) than in the two other tracks. Guapo seems to move effortlessly from one theme and genre to the next. It all sounds so natural, easygoing and logical, though there no doubt have been lots of blood, sweat, tears and toil involved to come up with an album like this. Obscure Knowledge and earlier albums by Guapo, too, are of the kind that you'll never get tired of. There's always something new to discover in the music no matter how many times you play the album. And the more you play it the better it'll turn. Try it if you dare. You won't regret, in the long run! Probably the album of the year for me in 2015.